recently, my mother sent me a photo of my brother this last christmas. he was wearing the hat i knit him the christmas before, and was still lamenting the first ribbed hat i sent him that he lost (middle top in the picture). and i felt all nostalgic (and guilty), so i immediately started making him another hat, since i didn’t make him one this year. i make a lot of ribbed boy hats. all the boys want fitted hats, and this is the easiest way to do that without having their head measurements. the boys, you ask? my brother. ben. ben’s three brothers. my dad. other people’s fathers and brothers. but especially brothers. the boys. so i’m (quite randomly) working up my ultimate ribbed hat pattern. 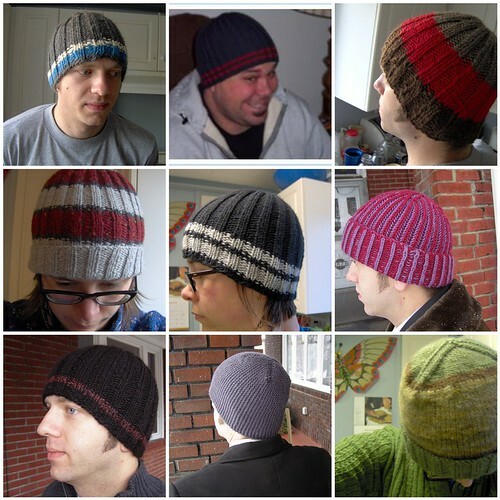 worsted weight, funky decreases, watchman style, or beanie style – you choose. i’m test knitting it myself, sending hats off to alaska and montana, now that spring is beginning and they aren’t really necessary (whoops!). but i hope to have the pattern up some time in the near future. my question for you is, what do you find yourself making over and over for a particular group of people or person? what have you found to be the perfect, useful pattern that you go back to over and over? p.p.s. don’t forget about the knitcircus giveaway! contest ends sunday. The hats I make for guys generally do involve a rib of some sort but I haven’t made enough of them a favorite method. yeah, i’ve made some huge ones too :) but not as many as i have ribbed hats! oh lordy… I’m almost embarrassed by how many snowman hats I’ve made. Almost, but not enough to stop making them. I made a ton of spiral noro hats and mama jane slippers this year but that was by design. The patterns I keep returning to, especially for handspun, is stephanie pearl mcphee’s one row scarf. Well that and my entrelac socks but that’s because I’m a fool for entrelac. yes to knitting in the round! it’s easier and it makes hats seamless. I am so addicted to knitting the turtle Sheldon (http://www.knitty.com/ISSUEwinter06/PATTsheldon.html)! I just can’t stop. I love finding a good pattern or idea and doing it over and over, and yet they all come out slightly different. I haven’t got a really good hat pattern yet, but I know when I find one, I’ll be making heaps. One can never have too many hats! that’s an incredibly happy pattern to be addicted to! socks and different kinds of neck warmers : cowls or scarves.